Zodiac was Mucha's first work under his contract with the printer Champenois and was originally designed as an in-house calendar for the company. In this composition, Mucha incorporated twelve zodiac signs in the halo-like disk behind the woman's head, one of Mucha's customary motifs. The majestic beauty of the woman is emphasised by her regal bearing and elaborate jewellery. The striking design of the Zodiac calendar quickly attracted the attention of Léon Deschamps, chief editor of La Plume; he bought the rights to distribute it as the magazine's calendar for 1897. 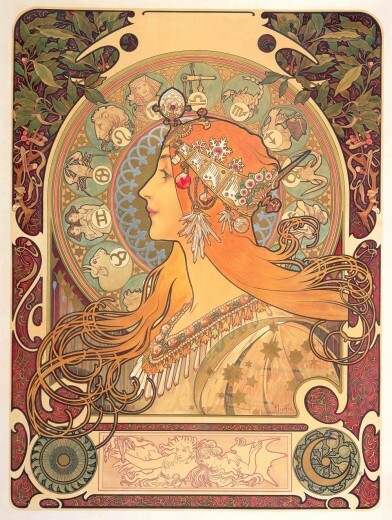 It became one of Mucha's most popular designs; at least nine variants of this lithograph are known, including this one which was printed without text to serve as a decorative panel.